Having trouble fully understanding the results grid. If you look at the image below, for the Public.Listing.ListingSearch.OnLoad, Time with self is 4.016. Does that indicate the time that the code spent in that method, excluding children? Time to await is 8,951.577, and so is Total time. I am assuming that Time to await is time spent waiting in that method for child methods to complete, right? If that's the case, shouldn't the Total time be a sum of Time to Await + Time with self? Secondly, the screenshot below. Does the Hit count and Time columns refer to the number of hits for the slice of time I selected on the bookmark bar or for the entire profiling session? I am assuming the former. Regarding the hit count in the source view, this does refer to the number of hits based on the selected time region. 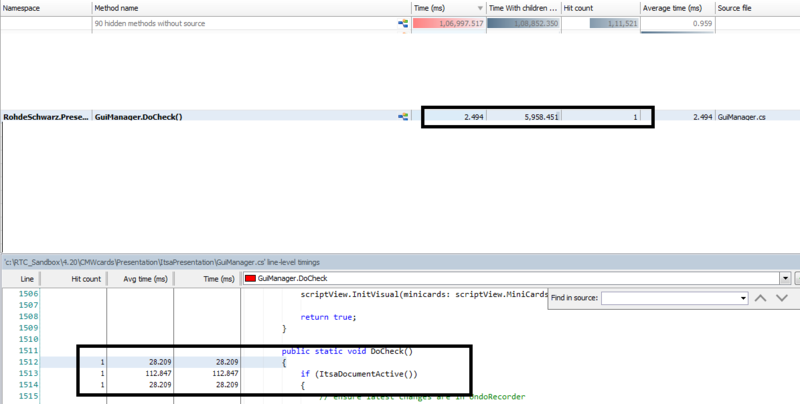 I am using Performance Profiler 9 version and I also see some difficulties in understanding of Time values. But on the other hand when we see code line it is almost change. So my question is what is actual time taken by method to response. Can I just double check if you have the entire timeline selected? The source view provides timings based on the entire profiling session, whereas the call tree gives timings only for selected timeline region. With that, the source view may be showing results for more of the timeline than what is selected. If you select the entire timeline, that may show timings more in line with each other.